Life is busy and adding children into the mix just makes things even more busy. Parents are working, running kids to soccer practice or music lessons, and finding a way to “do it all” its sometimes easier said than done. If you’ve found yourself feeling overwhelmed with the day-to-day activities of running kids to daycare before work, then rushing back to get them before going to the next to-do, it may be time to find a better plan. A nanny very well could be the answer. And once you’ve found the balance, your whole family will feel stronger. Here’s how. 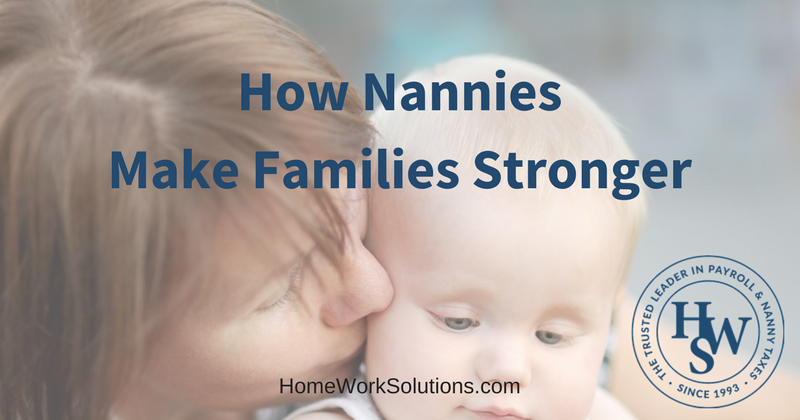 Nannies take care of the whole family. Yes, you hire your nanny to watch over your kids in your absence, but, a good nanny helps the entire family when needed. Whether it’s running an errand while you’re at work to pick up some miscellaneous grocery items or helping tackle the pile of clean laundry that is accumulating on the living room couch, your nanny can help provide the balance you need in your life to be a good parent and keep your house in order. During the day, your nanny can play with and help educate your kids and keep them pleasantly occupied. In addition, your nanny can help your children learn how to help around the house a bit - whether matching socks, folding wash cloths, making their bed or helping put pots and pans away in lower cabinets. This means that when you come home after a long day at work, you will be able to sit back and relax more and enjoy the love and cuddles from your little ones. Nannies provide affection while you’re away. In a busy, overcrowded daycare center, your kids simply won’t get the one-on-one attention that a nanny could provide in your home all day. Constant care and affection throughout the day while you’re gone will help make your kids stronger and more nurturing as they mature, and this is a benefit not just to your family, but to the world. Nanny care results in healthier babies. Did you know that according to the National Institutes of Health, children cared for in a day care center were 4.5 times more likely to be hospitalized for a childhood illness than those cared for in a home setting? The same study notes that illness in a child in a daycare setting "accounted for 40 per cent of parental absenteeism from work; the mean number of days lost per month was 0.52." With a nanny on board your children will be sick less, and you will have less unexpected absences from work as a consequence. A nanny is accustomed to caring for a mildly ill child at home, allowing you to keep to your work schedule. A nanny that enjoys spending time with your kids and providing them with the love and care that they need will soon become a part of your family and in the end, it will make your family unit healthier and stronger.